The first is a sale from 25 Feb 1863 from Peter Weiss to Anton Weiss, my second great grandfather. The second is a sale from 14 Jun 1864 from Paul Weiss to Anton Weiss. What do you think the chances are that these men are related to Anton? I’ve no idea actually, but it’s the only connection I’ve found between Anton and any other person named Weiss, save for the names of his parents in Germany. Are they cousins? Siblings? Completely unrelated? I don’t know. Time to do more research. There was another item in the map I found yesterday that is of interest to me. On one of the other sheets is a city map of Cassville, where my great great grandfather Anton Weiss operated a hardware store for close to 50 years. 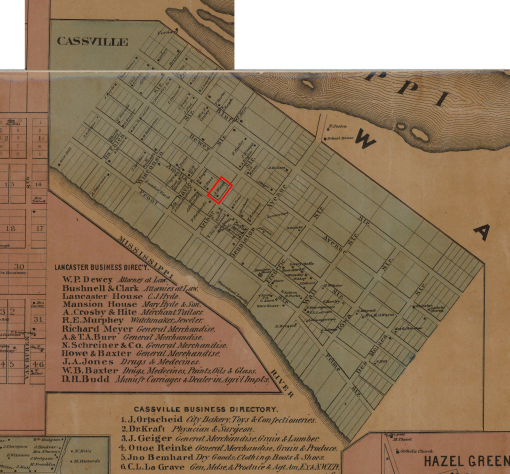 I’ve made one visit to Cassville, but at the time I didn’t know the location of the family home. 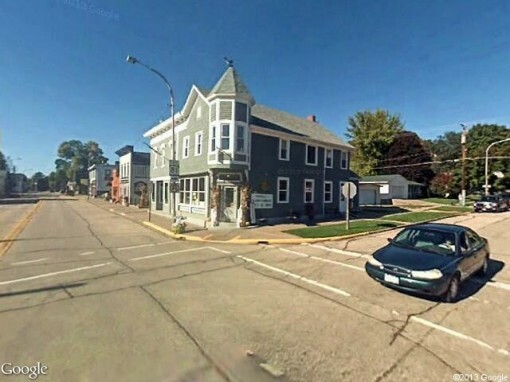 I have a great great uncle, Frank Weiss, who moved from the family home in Cassville Wisconsin to Pukwana South Dakota. 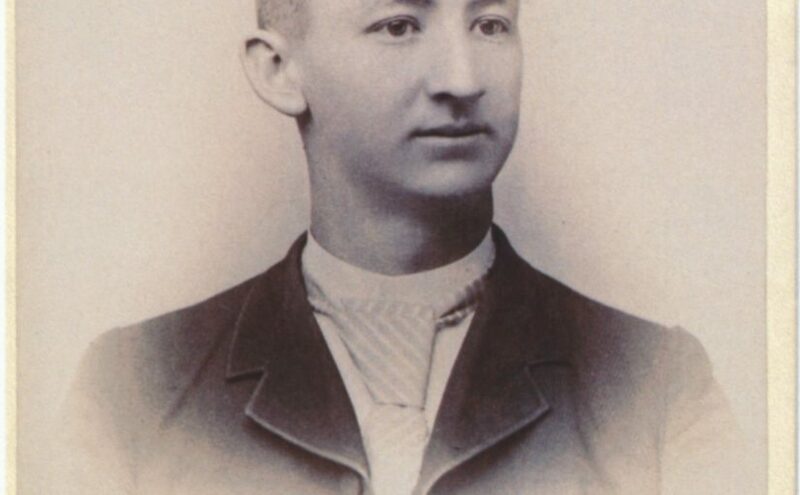 He married Nannie Conaway in 1890, and they had 4 children. Robert died young, and the other three were Marion, Theodore, and Agnes. I think I just solved some puzzles that in retrospect shouldn’t have been all that difficult to figure out. 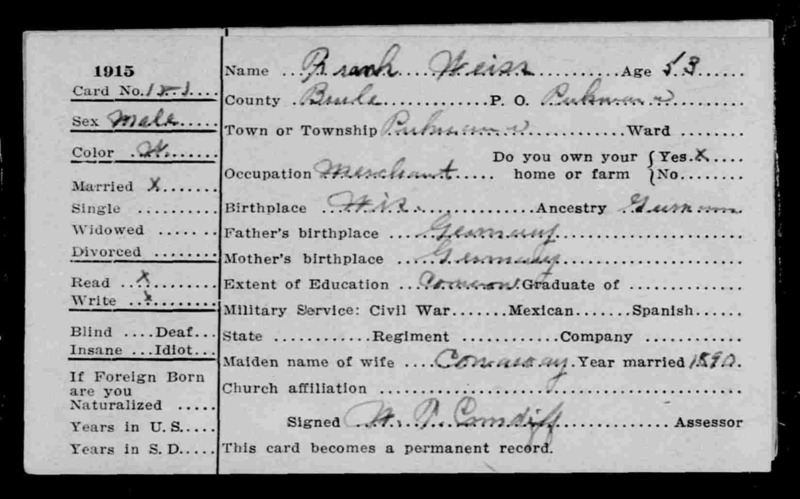 The first is that I found a census entry for Nannie Weiss living with Agnes Weiss in Carlsbad, New Mexico in 1920. Nannie and Agnes were also listed in Pukwana in 1920. I found the New Mexico entry several years ago and wondered what that was about. Vacation? 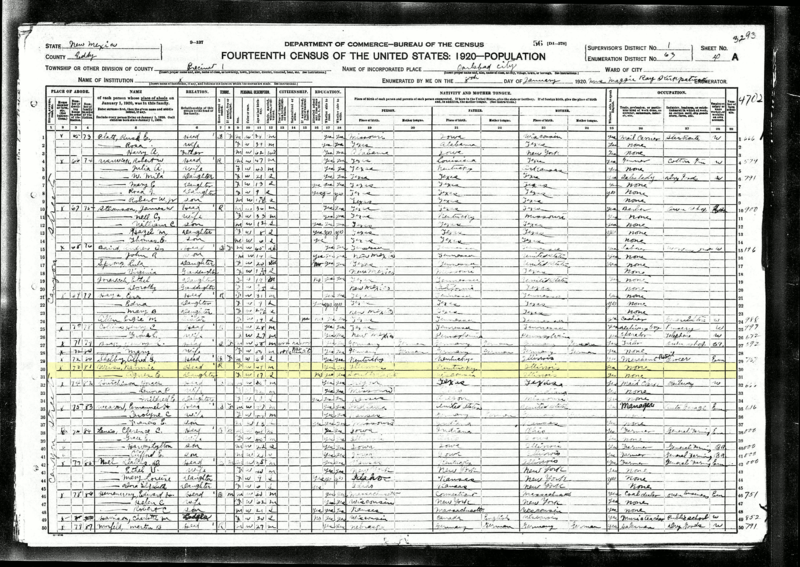 The next part of the mystery is the 1915 South Dakota state census. The only member of the family I could find was Frank Weiss. I figured Marion being missing was because she was attending the University of Illinois, as she graduated in 1917. And maybe Theodore was off working somewhere. And not finding someone in the records in a place I know they should be is very common. Records are spotty. I got a letter just yesterday from the Social Security Administration saying they had no record of my grandfather’s death, so they could not release information about him to me. Missing records are a common problem. I didn’t think too much of the missing members of the Weiss family. The last puzzle was Agnes’ obituary. 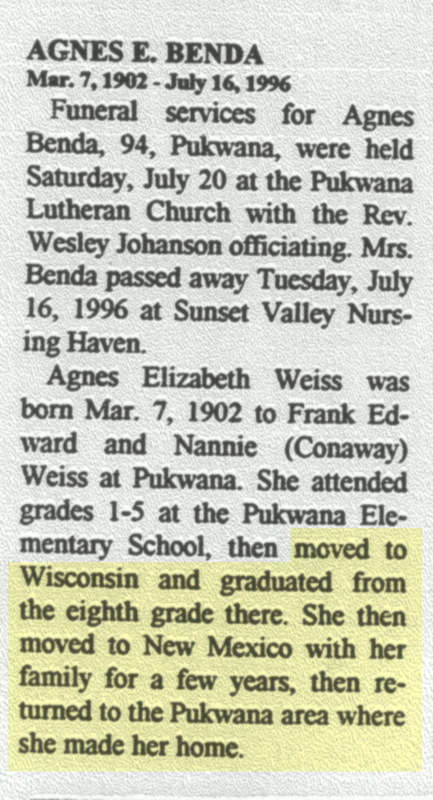 It mentioned that Agnes finished 8th grade in Wisconsin and then moved with the family to New Mexico for a few years. For some reason, I never connected that with the other pieces of information. 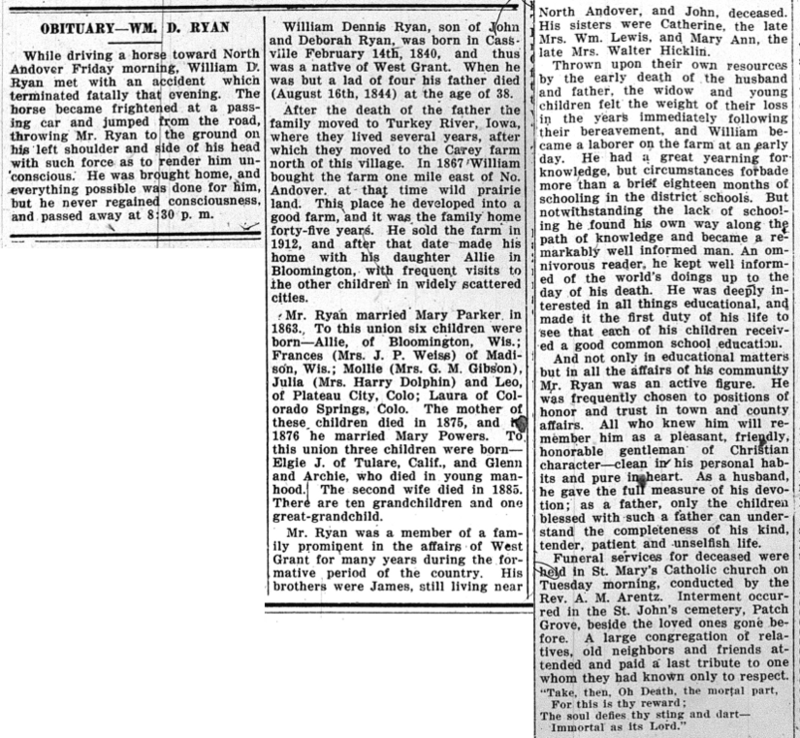 The obituaries for Nannie and the other children never mentioned anything about New Mexico. In fact, Theodore’s said he lived in Pukwana his entire life save for the time he spent in the military. It appears now that Nannie moved with the kids who were still at home. 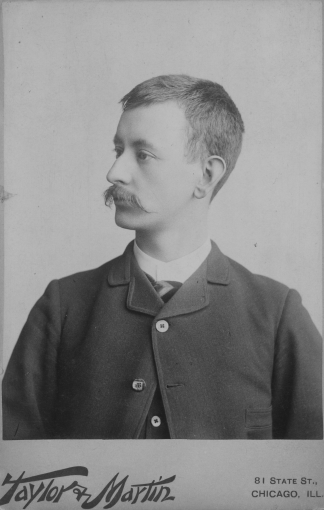 In 1915, the county assessor who conducted the census didn’t include them because he knew they didn’t live there. 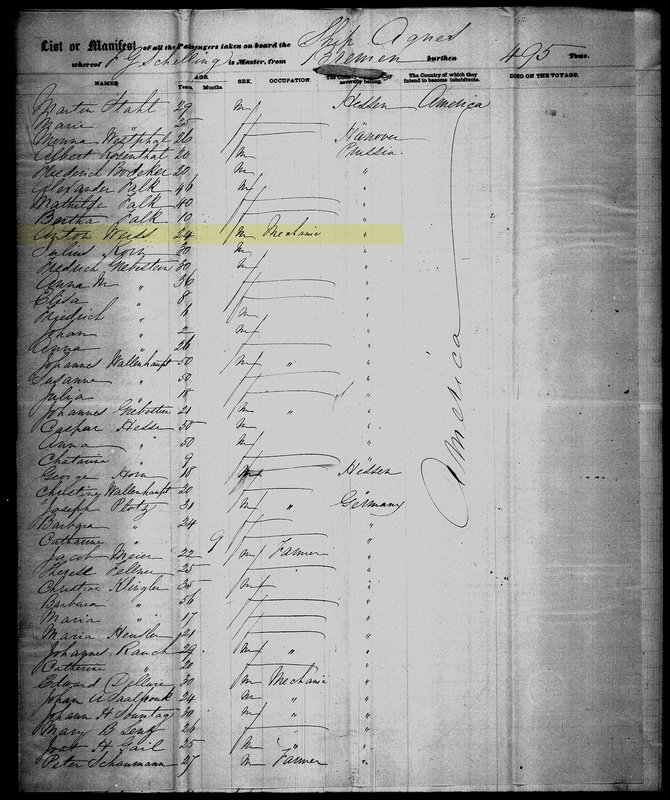 But the US Census in 1920 asks who normally lived in the domicile. And to Frank, Nannie and his children normally lived there, so he included them in his responses. At the same time, Nannie also answered the queries as if she normally lived on her own with Agnes in Carlsbad, New Mexico. The questions the records don’t answer is why Nannie took the kids and moved out for a time? There’s all sorts of possibilities, from domestic trouble to plans for the whole family to move to New Mexico that fell through. 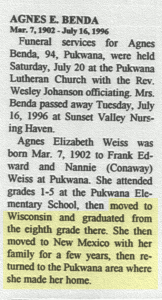 Perhaps the family fell on harder times and Nannie took several teaching positions. And why New Mexico? The last grandchild of Frank and Nannie died last September. 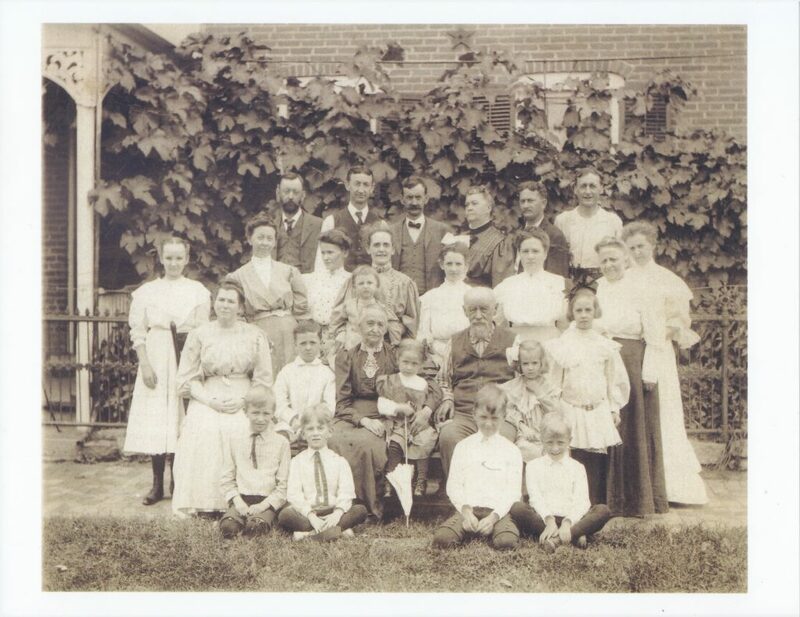 A number of great grandchildren are still alive, but none of them were older than 4 years when Nannie died in 1959. Unless Frank or Nannie wrote it down somewhere, I won’t get a chance to hear the story from someone who heard it directly from one of the participants. That’s why when I meet distant relatives, I don’t ask them about names and dates. I ask them to tell me stories. As I’ve been progressing with my genealogy work, I’ve been trying to improve my skills. The Board for Certification of Genealogists pushes the Genealogical Proof Standard. As a hobbyist, I’m not beholden to this standard, thank god. I don’t particularly care if the distant parts of my tree are rigorously proved or not. At least not at this time. However, I would like to have pretty solid evidence, particularly for the activities of my direct ancestors. One of the things a genealogist is supposed to do is write a research plan for investigating each claim. I’m experimenting with writing them for the less easy to document claims. I don’t think I’ll bother when researching items like my dad’s death. I have his obituary and his death certificate. But for something like my grandfather’s birth, I decided to write one. 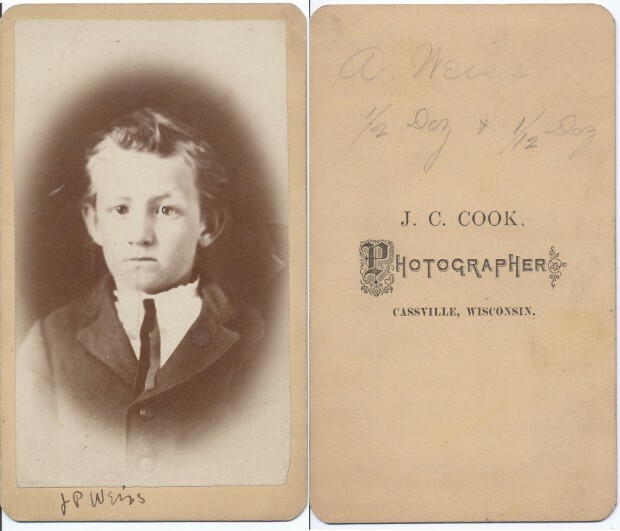 He was born on 5 February 1904 in Merrill, Wisconsin. But all the evidence I have for that is secondary and non-contemporaneous. What I do have is all consistent, so I would be highly surprised if original, primary, direct evidence contradicts the indirect and secondary evidence. I am unlikely to find original sources at this point, but there may be suitable derivative. You can read my plan for investigating George Archibald Weiss’s birth. The basic idea is to list the relevant known information, decide on a hypothesis, list possible sources of additional information, and create a strategy for investigating those sources. I don’t think there are birth certificates for 1904 from Lincoln County, but there are for sure better pieces of evidence than I’ve already collected. For instance, the counties returned lists of births to the state. 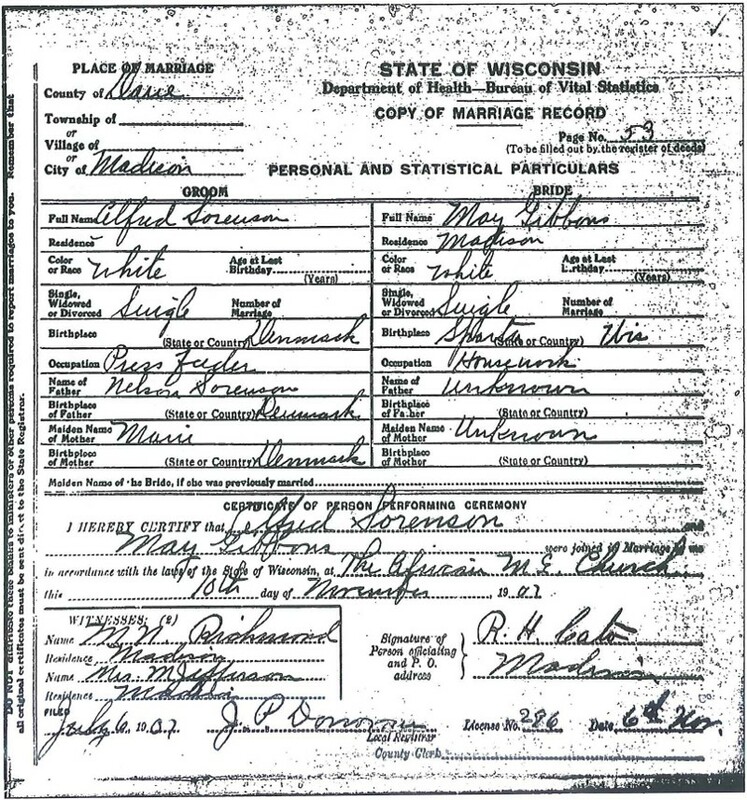 That list is what’s indexed in the Wisconsin Genealogy Index mentioned in the plan. Print-outs of the microfilm from that return can be purchased. And I can look to see if the local papers mentioned a new Weiss kid in February or March of 1904. Read the plan to see. I don’t know how well the plans I have written fit with what professionals do. The stuff I have seen on blogs here and there is pretty rudimentary. The one professional plan I’ve seen is an example by Elizabeth Shown Mills, who is the pedantic genealogist’s goddess. It’s involved, but was created for publication as well. She may not be quite as detailed and verbose for simpler research. Anyway, if I have really tricky items, or I want to publish, then perhaps I will make these more involved. For now, the few claims I’ve tried for this (I’ve got a total of 6) have resulted in me at least thinking of additional places to research, and in building a better task list than I previously had. Oh yeah, I’m experimenting with a new way of managing tasks too. I couldn’t find any decent tools for managing my genealogy tasks, so I’m doing a bit to roll my own. If anyone has an old copy of Microsoft Project or similar project management tool they’d be willing to sell me, I may use that for this tool. I tried OpenProj and ProjectLibre, which are clones of MS Project, and they are not up to the task. A future post will detail what I’m doing with regard to this. I just had the first practical need for the family history information I’ve assembled. The heirs for aunt Babe’s estate are all nieces, nephews, and grand-nephews, since she never had children and outlived all her siblings. The lawyers for the estate needed to know when her siblings died to establish that they are, in fact, dead. 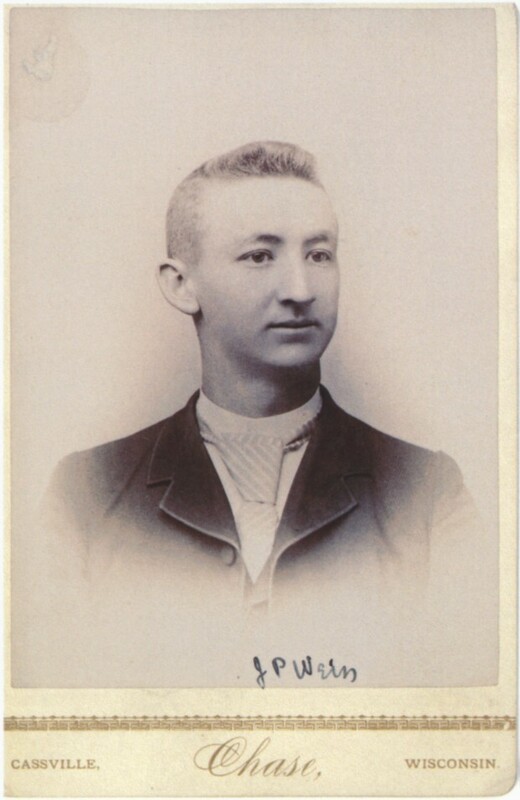 None of the living relatives were even alive when Babe’s oldest sibling Joe died in 1931. I just saved the family a bunch of money to research all of that.